Growing up, Thanksgiving at my house was pretty close to Norman Rockwell's depiction. Grateful for family, food and love. 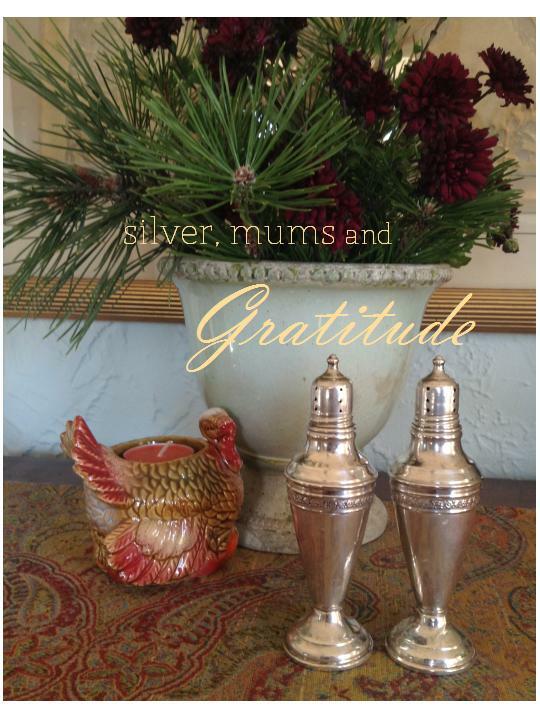 While my mom's Parker House rolls baked, I remember having two jobs -arranging mums cut from the backyard into a centerpiece and polishing the silver. Among the items needing a little TLC was this lovely pair of Empire style salt and pepper shakers. Aren't they beautiful! They belong to me now as part of my mom's very smart practice of giving items from our childhood to us as gifts. They mean so much more than any store bought present! Sterling silver tarnishes, especially when exposed to salt air and products containing sulfur, such as rubber bands and some papers. However, silver that is regularly used typically needs less care, so Tiffany strongly encourages you to use or your silver frequently and so do I. The notion of ‘saving’ items is kind of sad to me. What is so special in the future that could be more important than enjoying your beautiful things now? Tiffany recommends washing silver by hand in warm water with a mild detergent. Because many food acids and gases in the air can have a corrosive effect, they suggest that you wash your silver immediately after use. Silverware, and especially knives, should not be left to soak in water. To avoid spotting, it is important to dry your silver immediately after washing. Use a good paste silver cleaner. I like Wright's silver cream but lately I've only been able to find Weiman. The spray from Tiffany is great, too. Some "dip" polishes contain harsh chemicals and should be avoided. Some people say to use Electrolytic cleaning (aluminum foil, salt and baking soda in a water base) I don't recommended it. Begin by using a soft cloth or sponge to apply the polish. Rub each piece gently but firmly lengthwise, using straight, even strokes. You may use a small brush (like a toothbrush with natural bristles) for decorative trim or borders. Wash in sudsy dish soap water, being sure to remove all the polish. Rinse well in warm water, dry thoroughly and buff gently with a soft cloth. Don’t twist, especially items with stems. I learned this the hard way, twisting a stem loose from a compote dish. So sad. An "oxidized" finish is the deliberate blackening of crevices in the ornamentation of a silver object to make its decorative details stand out more clearly. Take care as this finish can be removed by overzealous cleaning and polishing. A little tarnish is actually patina and can denote age and value. Happy Thanksgiving - Use all your 'good stuff' and leave some of it out to enjoy all year! Why are Bridal Gowns usually White? I have been hunting for the perfect champagne colored lace- in a sea of white and ivory- to use for my niece's bridal gown, and it got me thinking about laces and the tradition of using white for wedding dresses. When asked why wedding gowns are usually white, most people will say that traditionally, white was worn as a sign of purity. Well, actually, that wasn't really true until the 1920's or so. Throughout history, brides wore their best dress, whatever the color. 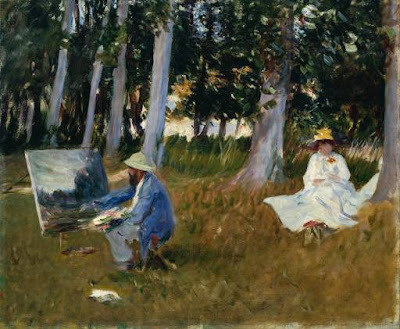 White was used as a bride's choice primarily to show wealth and status. Creating a white fabric was a costly process, therefore the using of it showed the family's wealth. 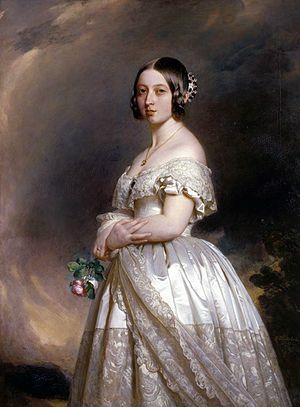 Queen Victoria, being a fashion icon, popularized the wearing of white and lace when she married her true love, Albert in 1840. It was considered unusual as colored gowns had been the norm. 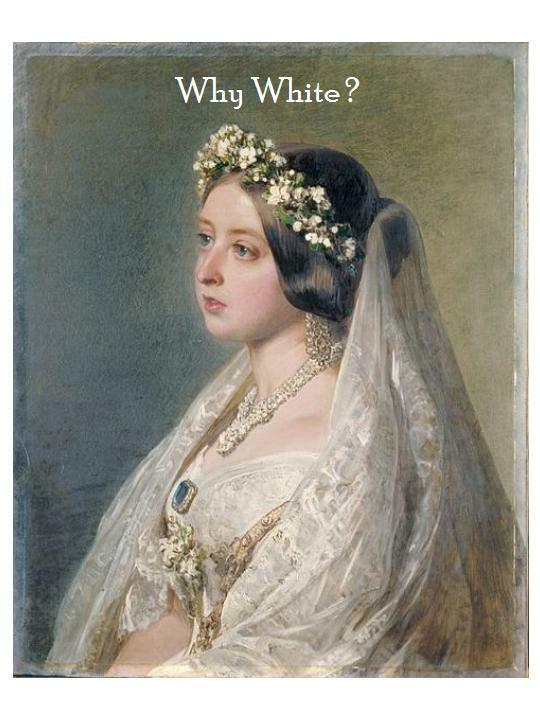 For Victoria, it was a political move. She chose Honiton lace, a British lace made in Honiton, Devon, providing a much needed boost to the local lace industry. She certainly wasn't the first to wear white for her wedding, but being one of the most popular royals ever, she is associated with the tradition. Here are some beautiful up close photos of Honiton lace. It is a hand woven bobbin lace and like all bobbin laces, it is very time consuming to produce. It can take about 4-5 hours to make a centimeter of lace. 1865 wedding ensemble trimmed with Honiton lace. Prince George in a replica of the Honiton lace christening gown worn by his father. This beautiful lace is still in use. In fact, little Prince George, was christened in a gown made from Honiton lace, just as were generations before him. So, there you go, a few little tidbits on weddings and lace. 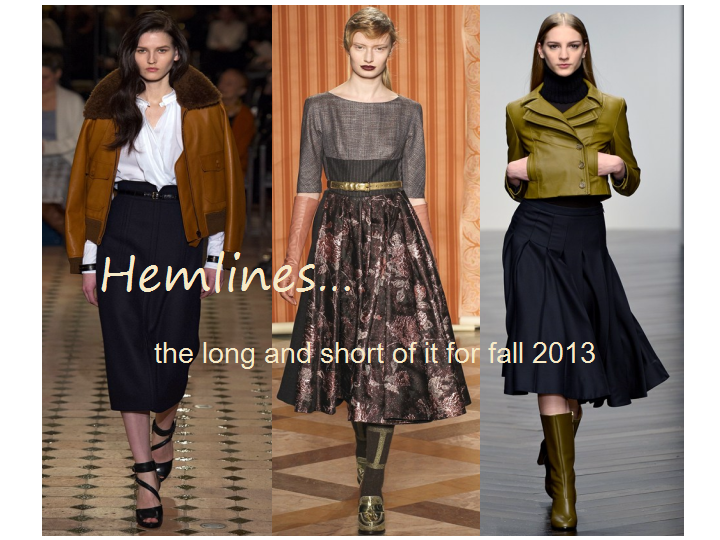 For most of the 20th Century, women waited for fashion gurus to dictate the acceptable hem length- anticipating whether their wardrobes would need revamping each season. 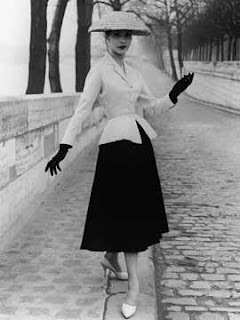 Post WWII, Dior produced skirts fuller and longer than any available during the war, creating an overnight sensation and making what most women had in their closets obsolete. In the 1970's, designers provided multiple skirt lengths. The ultra-mod mini skirt of the 60's was joined by the midi and the maxi and women finally had a validated choice! Most of us now combine what is happening in high fashion, street fashion, global trends, vintage influence and mix it all together to create our own style, often unaware of and unconcerned where the original influence began. The Midi length was all over the runway. -all midis are not created equally...it's just the length that they have in common- other than that, they come in many styles: straight, sarong, A-line, gathered, flounced, etc. Find the style that works for your figure. See my past post - how to measure yourself and figure out your figure here. -watch where it hits on your calf, if it lands on the fullest part of your leg, right in the middle, it can be a bit unflattering - just below the knee and just above or below the largest part of your calf will look the best. -choose your shoes carefully-pair with a slim, pointy toe heel or flat shoe works well. A big platform is not a good option here. -keep you eye on the silhouette created. A slimmer skirt can handle a fuller top but you can get a bit of a 'sack tied in the middle look' if the top and skirt are both full. Choose a more fitted top with a full skirt. -take a good look in a full-length mirror to find the best combo of blouse, shoe, and skirt. Generally, I think the fuller the skirt, the sleeker the shoe- just take a look at the whole silhouette you've created. Take cues from the gals in the 50's wearing all those Dior inspired looks. 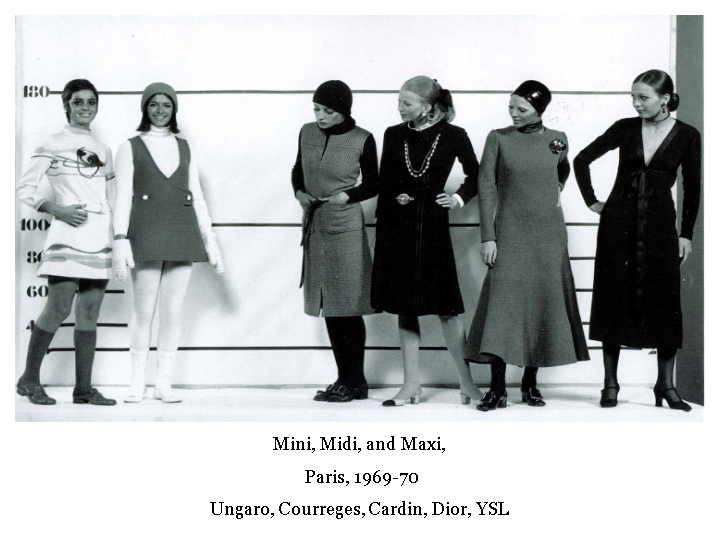 Although I don't believe we will ever allow ourselves to be dictated to by design houses so emphatically, it is interesting to watch the evolution of style trends and to see once again the 'top down' -designer to consumer- influence on hemlines. So, don't throw out your knee-length pencil skirts or toss your maxi dress. It still is a 'wear what you want and make it work' era. Find the silhouettes that work for you. Have fun with this 'new' length and be glad we have one more great option out there from which to choose!